Are you tired? We're tired. And while over here at Complex Pop, we're all really big pop culture fans, the huge breadth of movies, TV, video games, etc. that we consumed this year is making us in desperate need of a Calgon bath and a Rip Van Winkle level nap to prepare ourselves for 2016. But we can't complain that much, since 2015 was truly a wealth of riches from the celebs we got to speak to, the TV we watched, the films we loved and even the disappointments that the squad suffered. As we head into 2016, the pop culture horizon is looking bright, yet again full of comic book movies, #peaktelevision and godwilling a more diverse pop culture landscape in front of and behind the camera. So, there's some stuff that we think needs to stay back in 2015, our future pop culture landscape is brighter without it going forward. 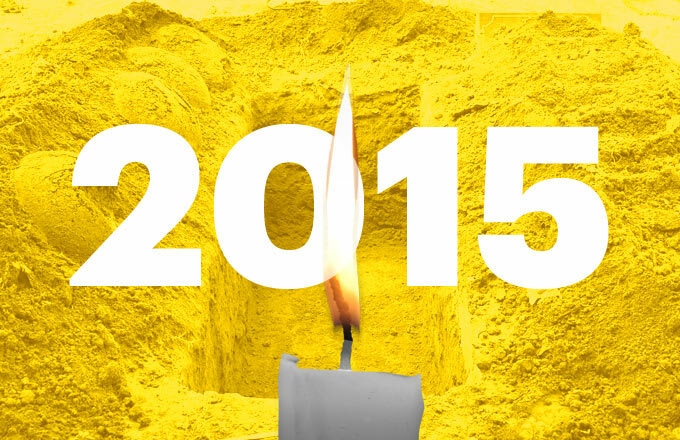 Let's pour one out to some of 2015's pop culture that needs to stay in 2015.